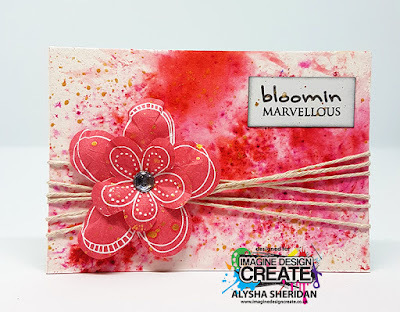 Hello everyone, today i am sharing a mixed media tag i have made with the super cute Finley Fox stamp set by Imagine Design Create. I have fallen in love with Finley Fox so I'm sure he will pop up in a few more blogs. Hello, how are you getting on with making a start on your Christmas makes? I have some more inspiration for this week using Imagine Design Create Bauble Silhouette stencil, this is a great stencil set that comes with the masks for the snowflakes as well as the baubles. I have also used a few other Imagine Design Create goodies. Here is what I've made this week using the fabulous Finley's Flowers Paper Pack. I had tried a mixed media card this time with torn paper edges and Gesso and stamped detail. This week I have created a mixed media canvas using the Solid Flowers, I have cut it out and shaped it, used glue gel to mount it onto the canvas over the string and I have just splattered brushos in the background then added a sentiment to suit.